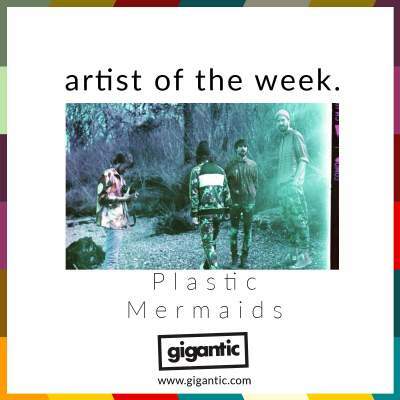 Taking DIY to its most imaginative extremes, Plastic Mermaids are the five-piece folk-electronica band bursting out of The Isle Of Wight who possess the rare talent of creating a vivid picture of their very odd world and invite everyone in to explore. Having constructed their very own analogue studio in a barn, brothers Douglas and Jamie Richards take the lead with the shared vocals, synths and samples, drummer Chris Jones, guitarist Chris Newham and bass playing Tom Farren are free to pursue whatever musical avenues they wish and follow them to whatever enigmatic madness they gleefully discover. This boundless sense of adventure also translates into incredible live performances, having sold out every gig they have played on the Isle including a two night mini-festival they put on in a boat shed and blown entire budgets on lasers and confetti. They first began to grab mainland attention with the release of their debut single ‘Polaroids’ in 2014 which would be accompanied by an impressive video featuring some snazzy stop time motion animation, establishing their penchant for heartfelt music and knack for creating mini movies right from the off. ‘Polaroids’ would be the first song on their gently endearing four-track ‘Dromtørp’ EP. The island lads carried on their run of excellent EPs which the release of the ambitious ‘Inhale The Universe’ almost exactly a year later which saw them expertly craft six songs of beautifully textured baroque pop and boisterous electronica. Plus, their dreamy record ‘Everything Is Yellow And Yellow Is My Least Favourite Color’ which came out summer of 2016. In October, Plastic Mermaids released their latest single ‘1996’ which is a taster of what we can expect from their debut album scheduled to be released next year. Euphoric and uplifting, the song immediately rises to fever pitch to become an almighty explosions of folky feelgood space rock. The accompanying video sees a reclusive technology obsessed man find love and adventure with a PC android he met on the train, having day dreamed of taking it on a romantic date water skiing on the cold waters of the British coastline. Brilliantly bonkers, and we can’t wait to hear the while record! Catch Plastic Mermaids when they begin to promote the new material with major gigs during March, next year. Plastic Mermaids tickets are currently available.